A lot of vehicles get much more hate than they deserve. I’m not talking about the PT Cruisers and Corvairs of the world, although I have opinions regarding them as well. No, today I’m talking about the 996 generation of the Porsche 911. Porsche, as a company, tends to not change its ways without dutiful consideration. That’s why the ignition is still on the left of the steering wheel in all vehicles, as it has been since their LeMans racecars of yesteryear pioneered the change and why the 911 has resolutely placed the engine in the wrong place since 1963. Their fan base reflects this adherence to tradition, and does not adjust to change well. The 996 was a drastic re-imagining of the 911. It was the first non air cooled engine. It was an all new chassis. It was an all new body, without the iconic round headlamps. The new headlamps were even described by many detractors as resembling fried eggs. Ouch. Unsurprisingly, the faithful were displeased. But time marches on, whether we like it or not. The 911 was forced to adapt to meet the challenges of the new world, or get left behind. Thankfully, it rose to the challenge. This is Ethan Wyatt, and his mother Ann’s, 996. It is a lightly modified 1999 Porsche Carrera. It was bought by Ethan’s father, Mike, as a red 911 had always been his dream car. Now that his father has passed, Ethan and his mom took over caring for the prized Porsche. Fret not, this is no trailer queen that has never seen a wheel turned in anger. Porsches are, above all else, built to be driven. the Wyatts’ 996 is no exception. It has nearly 90,000 hard miles under its belt, and has shouldered each one without complaint. Sure, the front lip has some pitting from the occasional track day, and sure, the BBS wheels have a bit of ingrained brake dust, but that is as it should be. It is a car designed to take every ounce of punishment you can dish out, and never break a sweat. Many of the cars I’ve been driving as of late require a bit of manhandling to extract the best from. Kingston’s E30, for example, took a firm hand to tame. Stomp it, throw it, kick it, slam it, and be rewarded with magic. The Porsche, on the other hand, is a precision instrument. More of a scalpel, and less of a hatchet. The steering and shifter are both shockingly light. I guess having no engine over the front axle has quite an effect. The steering is not loose or vague, like in some luxury cars, it is just…delicate. This requires a steady hand to drive quickly. You need to plan every move in advance. That pendulum weight is always hanging out over the rear axle, ready to sling you straight into a tree. That is not to say that the 911 is unstable. It pulls out of a corner like nothing else. Get the move right, and that extra weight just presses the rear tires into the pavement, and flings you out the other side. Once you’ve picked your line and your speed, you are committed. Don’t second guess the chassis. Use your head, trust the machine, and you’ll be fine. Do just like Ron Popeil says, “set it, and forget it.” Do all your finessing before corner entry, and then once you clear the apex, let the rear end settle, pin the throttle to the floor, and listen to that flat six scream as you charge forwards. In some cars, especially naturally aspirated ones, there is the sensation that you are going to break something the higher you rev it. A niggling concern at the base of your spine that something is going to fail catastrophically if you continue as you are. There is a physical limit to how fast you can spin red hot pieces of metal before they shatter. In the 996, that is a foreign concept. Do whatever you want. It’s fine. The motor will take it. 7,000 rpm with that boxer engine bellowing behind your head is like nothing else in the world. It feels like the car is egging you on. “Come on, you’re not even trying,” it seems to berate you. Heel-toe the downshift and kick those revs skyward, it doesn’t mind. If you neglect one single millimeter of that tachometer, you’re missing out. I’ve long been a Porsche fan, even though I’m a bit rusty on the nomenclature. This makes me a bit of a heathen, I know. But I’ve never been bogged down too much in regards to the details of chassis codes, or engine displacements. I’m much more concerned with the intangibles of a car. How does it feel? More importantly, how does it make ME feel? Is it light and playful like a Miata? Is it rowdy and aggressive like Kingston’s E30? Every Porsche I’ve ever driven, from Caymans, to Cayennes, to 911s, just seem to…work. Not just in the sense that they don’t break, although the Wyatt’s 996 has fewer squeaks and rattles than my own car, even though it is a decade older. I mean that everything has the feel that it was designed by an engineer first, and a stylist second. Even when they are not the fastest vehicle in their class, they seem to just offer the most driver engagement. 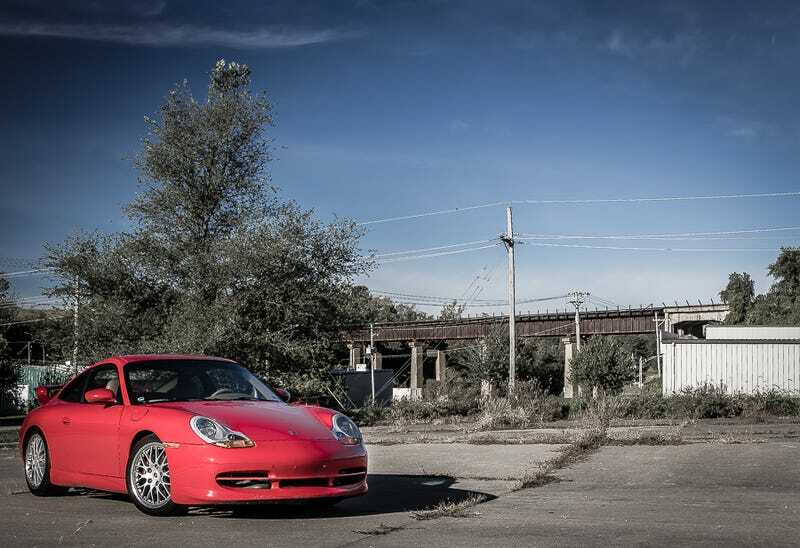 The Wyatts’ 996, like all great Porsches, is more than its numbers. In an hour of hard driving, I only checked the speedometer twice. The overall speed is irrelevant. That’s not to call it slow, but top speed alone misses the point. It is a car of sensation and precision. How fast it feels like you are going is so much more important than that easily ignorable readout. It is like riding a motorcycle. You glue your eyes to that redline, and every other gauge is irrelevant. Just wind it out higher and higher, and work on getting your lines smoother and faster. It is a car that rewards delicacy, and punishes hamfistedness. So is the 996 the beginning of the end for Porsche? No. I think it is the end of the beginning.